The Martian | Kid Reporters' Notebook | Scholastic Inc. 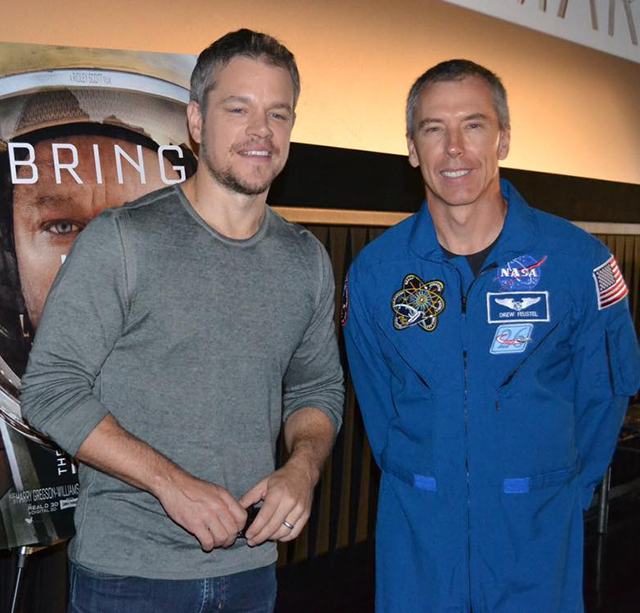 The Martian, a new sci-fi blockbuster, stars Matt Damon as astronaut Mark Watney. Directed by Ridley Scott, the film begins with the astronaut getting stranded on Mars. He must find a way to survive. This includes growing food on a planet with an unbelievably harsh climate, creating water from the resources he has gathered, and trying to contact NASA (National Aeronautics and Space Administration) to rescue him. Despite the seriousness of the astronaut's predicament, the movie is hilarious. “We're always captivated by the way people can do [extraordinary things and remain] calm when they are in these incredible, high-stress situations,” Damon said recently at a press event at NASA's Jet Propulsion Laboratory at the California Institute of Technology. Indeed, space exploration has captivated humans for centuries. "It's the edge of technology," observed astronaut Drew Feustel. "It's being in a place where humans haven’t been before and exploring." The Martian is based on the 2011 novel by Andy Weir, who spent much of his childhood reading sci-fi books and studying computer programming. In his book, Weir was able to draw upon both passions. “I grew up reading classic sci-fi from the 1950s and '60s," he said. His favorite authors are Robert A. Heinlein, Isaac Asimov, and Arthur C. Clarke. "For Heimlein, he said, "I’d go with Tunnel in the Sky, for Asimov, The Caves of Steel, and for Clark, Rendezvous With Rama." Weir is currently working on a new novel about aliens, faster-than-light travel, and telepathy. NASA scientists and astronauts are continuing to explore these subjects, which were once left only to the imagination.